Inkberry Holly is a broadleaf evergreen shrub with an attractive upright, oval growth habit and dark green lustrous leaves. 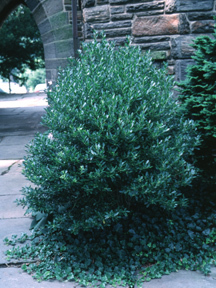 Inkberry is a good alternative to boxwood where a taller and faster growing broadleaf evergreen is needed. It is one of the few evergreen shrubs that can thrive in a wet site. Inkberry produces insignificant fruit and does not need a pollinator.